Firstly, TiananMen Square with its main monuments, buildings and immediate surroundings. The Worlds Largest City Square and its Revolutionary Monuments as well as TiananMen Gate of Heavenly peace are clearly visible in the North-West (Upper Left) Corner of this Image. Secondly, the Beijing (Former) Legations Quarter, a small section in the extreme South of Dongcheng District on the border of Chongwen District. This small but historic section directly East of TiananMen Square was claimed by Western Colonial Powers in 1861 AD in the aftermath of the Opium War. For a long time it was the European Quarter of Beijing, and expresely off-limits to all Chinese Citizens. The Legations moved away between 1929 AD when a Chinese National Government was established at Nanjing and 1959 AD, when a new Embassy Quarter was opened at Sanlitun. 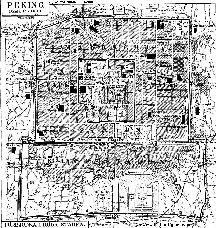 Schematic Map of the 1900 AD Legation Quarter, The Legations and More - Click through ! and Past current days New World Building, Apartments and Malls into what is now formerly a Muslim (Hui Nationality) Hutong Area of Beijing (find it around West Flower Market Street). To The South the Hutong extended as far South as the the Northern Gate to Temple of Heaven Park and its Wall, albeit under the different name of Zhusikou Hutong. 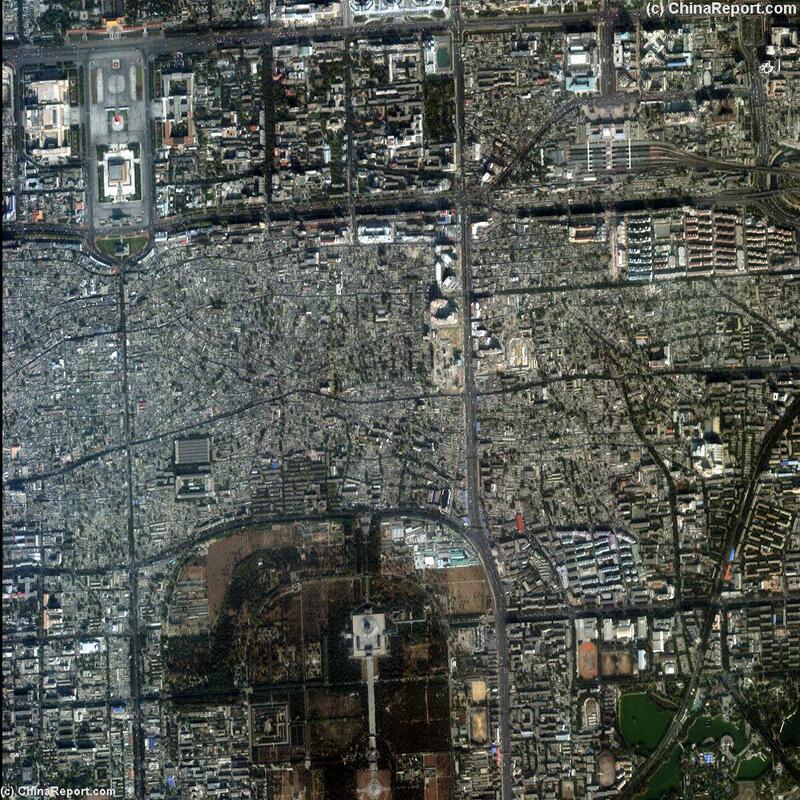 Unfortunatly, since the year 2002 AD, drastic changes have taken place in the area of this Image, especially in the QianMen, Xuanwu and ChongwenMen Hutong. Therefor, this Image can no longer be used as a current day Map to the Hutong. Instead, this is now a historical image showing you the Hutong as they were before the Olympic onslaught of 2002 AD to 2007 AD - More information on the QianMen Hutong below this Map. As described in short above this Map, The QianMen Hutong, and other Hutong Area's on this Satellite Image have undergone major changes in the years between Spring of 2002 and Today (March 2008). The First Hutong to be annihilated in this Section of Beijing were the Hutong South of ChongwenMen (and Ming Dynasty City Wall Relics Park) starting in the year 2002. In 2002 only sections of Hutong were demolished to make way for the Construction of Major New Malls and Office Buildings along ChongwenMen Nan Dajie'. As a result by 2004 at least 5 modern and large Buildings had been erected along ChongwenMen Nan Dajie', the road leading South from ChongwenMen. Among these were the New World Plaza and Malls, Soshow - The Mall, and buildings further South along ChongwenMen Nan Dajie'. After the earliest 2002 Planning Phase had been completed, by spring of 2004 AD more Hutong were put to the Hammer. 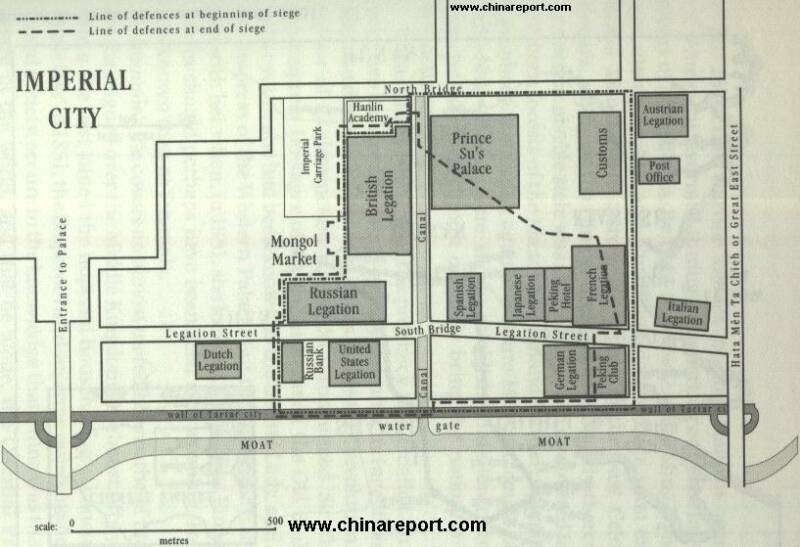 The 2004 AD Phase of City Planning was much larger in scale, more ambitious (partially du to the Olympic appointment) and involved changes to the entire Hutong Area between Liu Lichang Street in Western Xuanwu and beyond West Flower Market Street in Chongwen District. In Short, starting at ChongwenMen in the West, the plan slowly worked it way West through 2004, 2005 and 2006 AD. In this Case the First Hutong to disappear where the Hutong immediately South underneath ChongwenMen. In the Past these Hutong had been the location of a Hui Muslim Village underneath and outside of the Old City Gate into the Imperial City. The Hui Village was destroyed completely, except for its Old Mosque and the ChongwenMen Fire God Temple, both of which have been renovated since and can be visited at West Flower Market Street . The Hui Muslim Hutong and remnants of the Village were replaced by the Beijing Glory City and its Luxury Apartments. Original inhabitants were basically driven out as they were unlikely to be able to afford these new accommodations. The Glory City was Completed an opened by End of 2006 AD, which the first People moving in right away. Meanwhile the Destruction had been moving on Westward. In November of 2004 AD, the Hutong West of ChongwenMen Nei Dajie' saw their first Demolitions. First of all, everything West of the New World Plaza and Mall was leveled to make way for the New World Luxury Apartments. Furthermore a road was cut leading South from the Former Rue Marco Polo and QianMen Dongdajie' all the Way South to the North Gate of Tiantan Park to give easier access to the New Apartments and Chongwen District. Other sections on the Demolition List were the Hutong immediately South of the QianMen but East of QianMen Dajie', this is underneath Former Front Gate of the Imperial City, and Due West of this location, in November of 2004 AD suddenly the Middle Section of Dashilan Street disappeared. Destruction of the Hutong North of Dashilan and East of QianMen Dajie' were still ongoing into the Summer of 2005 AD. In that same Summer of 2005 AD, yet more of the QianMen Area Hutong were demolished. Earlier only a few hundred meters of the corners of the Hutong between Dashilan Street and QianMen Gate had been destroyed, however this Time much more of the small alleys were to be cleared, moving South along planned lines, while leveling almost everything in sight. In 2005 AD, much more of the viewed Central Hutong Area had been demolished, however it is hard to delineate the sections on this Map. By Spring of 2006 AD, many of the Small Silk Stores and other cheap trinkets sellers had been removed from the Hutong at the East Entrance into Dashilan Street (East). It was completely closed down shortly after. In 2007 the QianMen itself was closed for Renovations. At that same Time QianMen Dajie', leading South from the QianMen was closed and both sections of demolished Hutong along this major Avenue boarded off. Renovations of QianMen Street and Dashilan East Street into a modern day Retro-Traditional but Modern Shopping Bonanza forthe many coming visitors is underway. An electric Tram will be included to connect Dashilan's Shops with the crowds of TiananMen Square. It is supposed to be a rebirth of the Glamour of Dashilan (Big Railings Street) along the Lines of the earlier revival of Wanfujing Street and the renovations of Liu Lichang Street. Today in Spring 2008 AD, only small sections of the QianMen Hutong remain. A Road has been cut from Zheng Yi Lu and QianMen Dongdajie' to unplug car-traffic and connect further down south to QianMen Dongdajie'. Similarly, West of QianMen Dongdajie' a Road has been cut Southward from (West) TiananMen Square to connect with QianMen Dongdajie'. This new Road cuts right through the middle Section of Dashilan Street, separating the East Section from the West Section. Some Hutong south of Dashilan Street have been levelled, however many others remain. Equally outside of this Map, Hutong south of HepingMen and around Lui Lichang (Culture) Street have been deminished by the Road cutting through to the South, however many others remain and are now on the Cities' Protection List.